This ribbon came off gift wrapped item I had ordered from Novica, which is a site that sells all fair trade gifts. This ribbon stood out to me because the rest of the wrapping was so primitive. The paper looked like it was homemade, as did the cardboard used to protect the item. 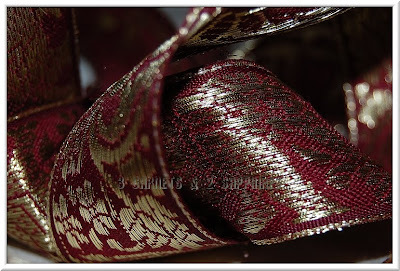 Then here we have this elaborate burgundy ribbon with gold shimmering embroidery. It just did seem to mesh with the rest of the other wrapping materials.